Now let's try this, here's mine. A funny man rub salt on the bus looking at west and east. glad to see you play along... anyway i added four of your blogs in answer to the comment that you left on my blog. 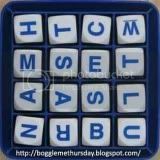 wow, it's nice to see you playing boggle me thursday.